“[B]y what right does the BBC airbrush from reality the swath of informed public opinion that sees the invasion as a crime, rather than as a mistake? By what right does it declare this framing of the topic ‘impartial’, ‘balanced’, ‘objective’ reporting? This entry was posted in Broadcasting, Editors' pick and tagged Andrew Marr, Baghdad, BBC, British Broadcasting Corporation, david cromwell, david edwards, Ivor Gaber, political editor, Prime Minister, the first post, the News, Tony Blair on September 14, 2009 by Judith Townend. “A court in Baghdad sentenced Muntazer Al-Zaidi this morning. More details here, at Guardian.co.uk. This entry was posted in Editors' pick, Press freedom and ethics and tagged Baghdad, defence lawyer, Guardian.co.uk, Iraq, muntazer al-zaidi, mutazar al-zaidi, shoe-throwing, Sky News on March 12, 2009 by Judith Townend. Managing the kit was one big probleim foor Adam Westbrook when he went to cover the First Battalion of the Yorkshire Regiment in Baghdad for his radio station. “But juggling equipment isn’t the only problem for a multimedia shooter, I learned. The big challenge is juggling content,” Westbrook comments. His observations and tips for multimedia journalists in the field. This entry was posted in Editors' pick, Handy tools and technology, Multimedia and tagged Adam Westbrook, Baghdad, First Battalion, Iraq, multimedia, Yorkshire Regiment, Yorkshire Regiment in Baghdad on March 9, 2009 by Judith Townend. We as journalists believe that our colleague Muntadar al-Zaidi, who protested at President George W. Bush in Baghdad on Sunday is guilty of nothing but expressing Iraqis’ legitimate and overwhelming opposition to the US-led occupation of their country. We call on you to guarantee his safety and effect his immediate release from custody. This entry was posted in Journalism, Press freedom and ethics and tagged ambassador, Baghdad, Court of St James, George W. Bush, Grosvenor Square, journalist, Muntadar al-Zaidi, muntazer al-zaidi, mutazar al-zaidi, President, Robert Holmes Tuttle, United Kingdom, Workers Against the War on December 19, 2008 by Judith Townend. NYTimes.com has launched Baghdad Bureau, a blog looking at stories about daily life in Baghdad outside the Green Zone. The new blog is a collaboration between reporters, photographers and western and Iraqi staff that live in the Iraqi capital outside the Green Zone and will focus on the daily challenges, like travel and checkpoints, which confront the city’s inhabitants. It will attempt to tell these stories using text, slideshows and videos from the staff, as well as posts and videos submitted by Iraqi readers. The blog will also invite Iraqis to write about their personal journeys, such as their decisions to stay or leave the country and the feeling of running into the aftermath of a car bomb explosion. It will also feature a forum to answer questions on issues about Iraq. This entry was posted in Newspapers, Online Journalism and tagged Baghdad, Baghdad Bureau, blogs, car bomb explosion, Iraq, NYTimes.com, USA on February 28, 2008 by Oliver Luft. A posting on SplashCast.com reviews some bastions of investigative journalism on the web. Most are from the US, but London-based indie documentary distributor Journeyman Pictures gains an honourable mention. Daily news show Democracy Now! comes highly recommended, as does the on-the-ground footage from Alive in Baghdad, which takes footage from Iraqi correspondants. 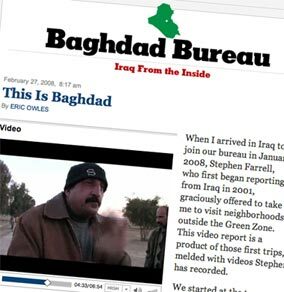 This entry was posted in Online Journalism and tagged Baghdad, Daily News, Democracy Now!, indie documentary distributor, Journeyman Pictures, London, United States on September 17, 2007 by Laura Oliver.